i would definitely recommend this product to others. it offers the flexibility we needed in a closet organizer. you can add, take away or modify whenver you need to! very easy! 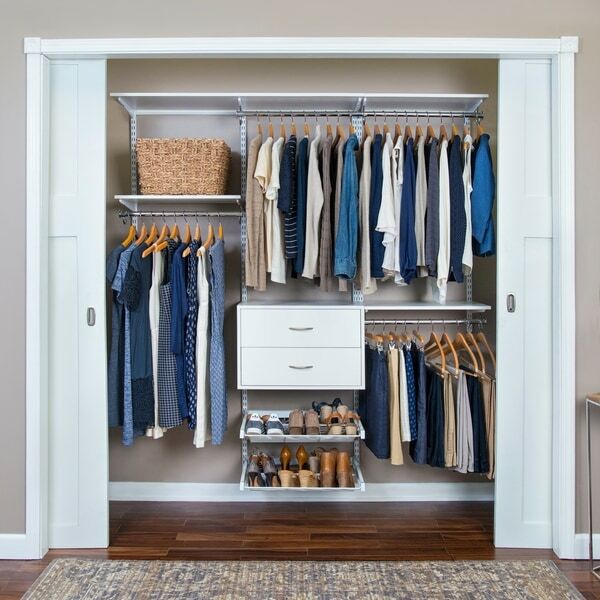 Maximize every inch of space in your closet with the freedomRail Ultimate Adjustable Closet Kit. It's easy to install, and truly adjustable; move shelves up and down, and left and right at any time without tools. With freedomRail, enjoy the luxury of organizing your space now with the option to add on accessories later to suit your needs. Ultimate closet kits feature a 2-Drawer OBox (Organizational Box) and Reveal Shoe Shelf, storing up to nine pairs of women's and five pairs of men's shoes for optimum storage. This closet kit fits 72"- 76" walls with ease. When measuring your space, be sure to subtract one inch from the total width to ensure the kit fits correctly. Closet kits have been specifically designed for easy installation; cutting is not required. Hardware is included. Made in the USA. ADA compliant.